You're a sales manager who's relying on your team to give you a number of leads. While your sales reps work hard on generating and converting as many leads as they can, certain leads might still go unnoticed. Say, for instance, a sales rep attempts to contact certain leads but her efforts are in vain, or she chooses to contact certain leads in the future. But in the midst of the daily activities, it slipped her mind. Over a period of time, there could be several such leads that are skipped by one or many of your reps. You never know how a lead might turn out until you make a decisive attempt and either get lucky, or close them for good. But, how would you find out? You can use a time-tracking filter to zero in on those leads which were not attended to for a certain period of time, and follow-up with them. 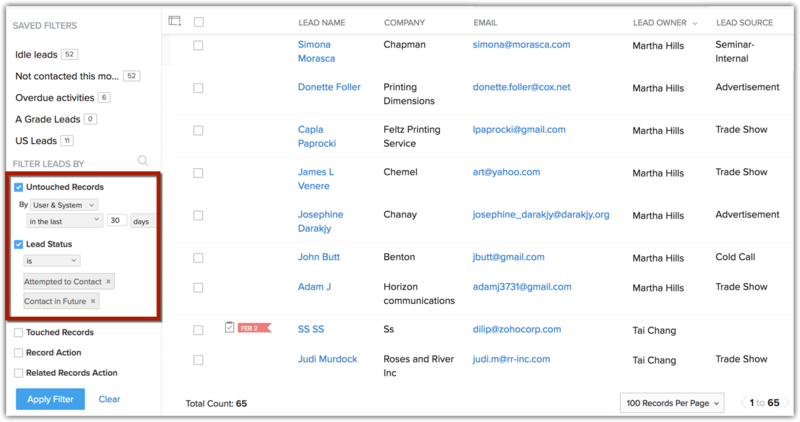 All you have to do is go to the Leads module, select All Leads and Filter Leads by Untouched Records. Select the time period as the last 30 days. Select Lead Status and specify Attempted to Contact and Contact in Future, and get the list of leads. You can select them all to create a follow-up task or send a follow-up email right away! Not just Leads, you can apply this filter to Accounts, Contacts, Deals and other custom modules too. So don't let any record fall through the cracks!